LemonCello proudly present debut EP, “Stuck Upon The Staircase”, out April 26th. Following a very successful Kickstarter campaign to fund the process in November 2017, LemonCello set out in December to record the three-track EP live in Orlagh Estate, Rathfarnham with recording engineer Cian Hamilton. The band spent much of 2017 writing the songs for this EP, and are very excited to release the product of this hard work into the world. 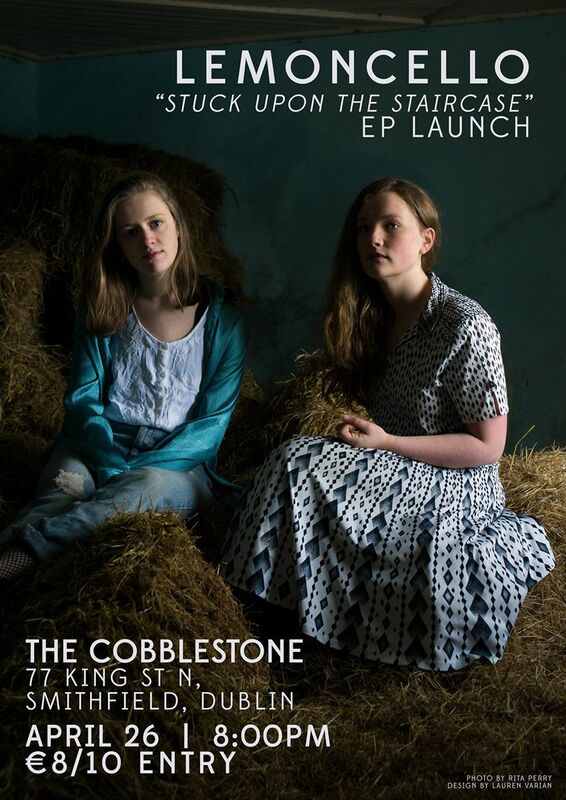 LemonCello have a very exciting show planned for the launch in The Cobblestone on April 26th, with support and guest musicians TBA. Tickets for the launch are priced at €8 Early Bird (plus booking fee), available online only at https://www.eventbrite.com/e/lemoncello-stuck-upon-the-staircase-ep-launch-dublin-tickets-43829410948, and €10 on the door. Laura Quirke (guitar, vocals) and Claire Kinsella (cello, vocals) started performing together while studying music and languages in Maynooth University, Ireland. Harmonious vocal melodies simply accompanied by cello and guitar, lend a sincere and honest rootsy sound, borrowing from wide range of influences, traditional and alternative. The result is music described by Remy’s Music Blog as “soothing for the soul”. In their relatively short life-span, LemonCello have played a sold out show in France at the beautiful Musée de La Piscine in Roubaix, supported Irish folk hero Damien Dempsey, played several music festivals across Ireland, and helped start ‘Common Grounds Collective‘, a group dedicated to building a network of artists of all genres, and give them a platform to write and perform original works within a nurturing community environment.